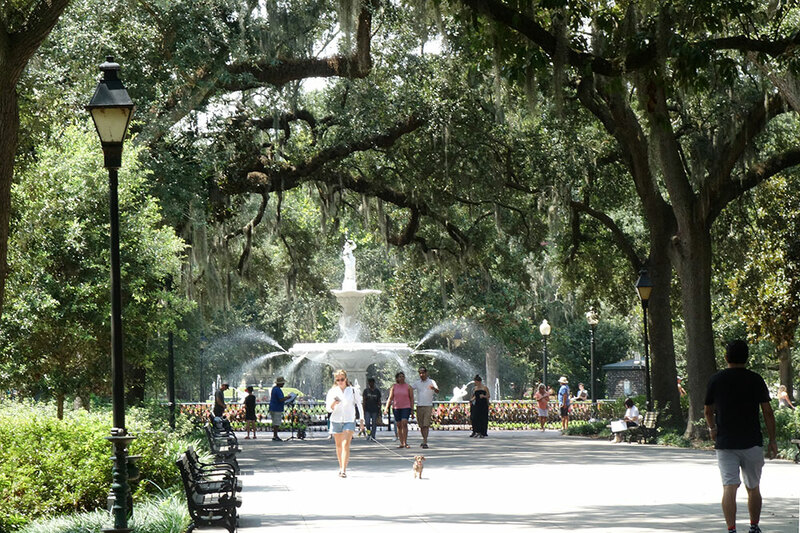 For many years, Savannah and Charleston have been billed as rival sister cities. As the story went, both of them had colonial pedigrees — Charleston was founded in 1670, Savannah in 1733 — and airs of patrician gentility engendered by the mansions of their historic districts, but Savannah was the good-times girl compared with her more straight-laced older sibling. This storyline got a big boost in 1994 from the best-selling novel (and subsequent movie) “Midnight in the Garden of Good and Evil,” with a plot that spun on the eccentric high jinks of Savannah life behind closed doors. Today, though, the two cities, which are only a little more than 100 miles apart, are often visited on the same trip and have increasingly come to resemble each other. Both have thriving economies — Savannah is now the busiest port on the East Coast after New York — two of the best and most unique restaurant scenes in the United States, and an ever-growing constellation of museums and attractions. The popularity of this twin-city destination explains why their respective hotel portfolios continue to grow. 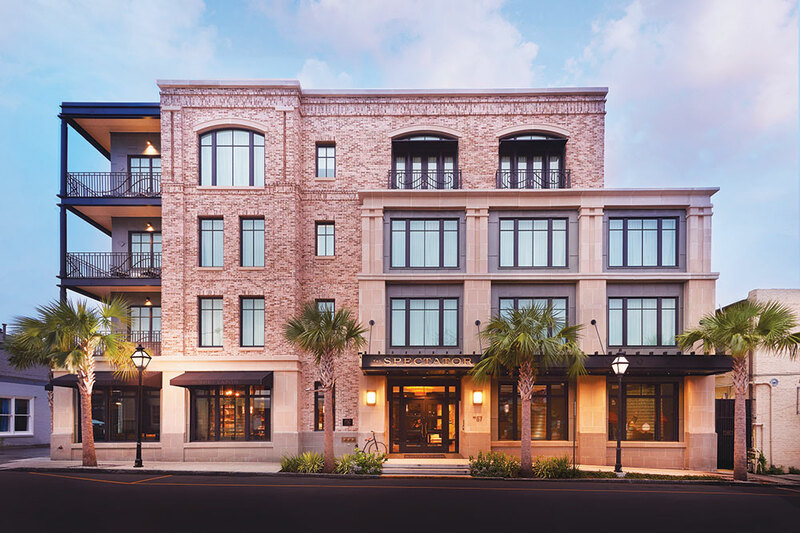 Recent openings include the 41-room Spectator Hotel, an establishment where Jazz Age glamour meets the Old South, and the 145-room Kimpton Brice Hotel in Savannah, which aspires to a contemporary Brooklyn vibe. Since The Spectator has a very inconvenient 4 p.m. check-in time and we had arrived at the Charleston airport just before noon, we decided to have a leisurely lunch at The Glass Onion, a highly praised casual restaurant in the city’s suburbs before heading into town. This proved to be an excellent decision in both gastronomic and logistical terms. Back at The Spectator, we left our car with the amiable parking valet and headed to reception. 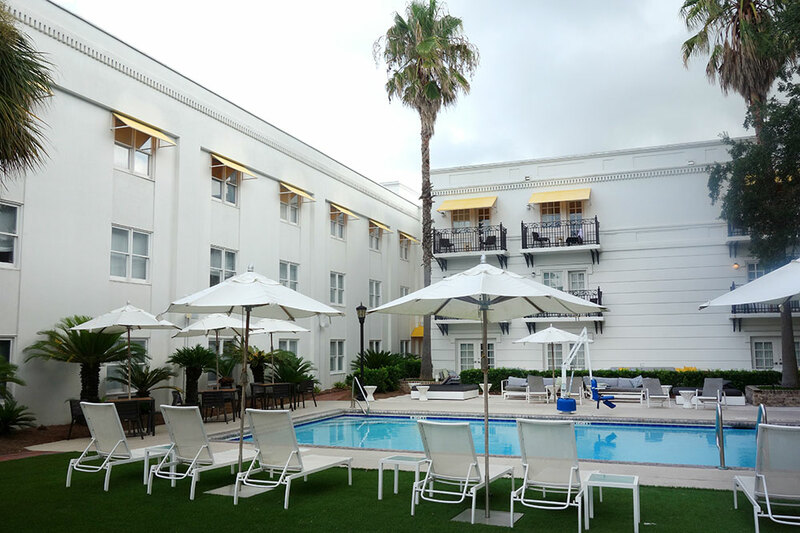 The red-brick structure is relatively new but has settled into the cityscape as though it’s been there forever, while the hotel’s stylish lobby and public rooms display a louche glamour. A dapper and eager staffer escorted us upstairs to our Deluxe Suite. Though pleasant and chatty in the elevator, he never got around to detailing the services that are offered by the hotel’s team of butlers. 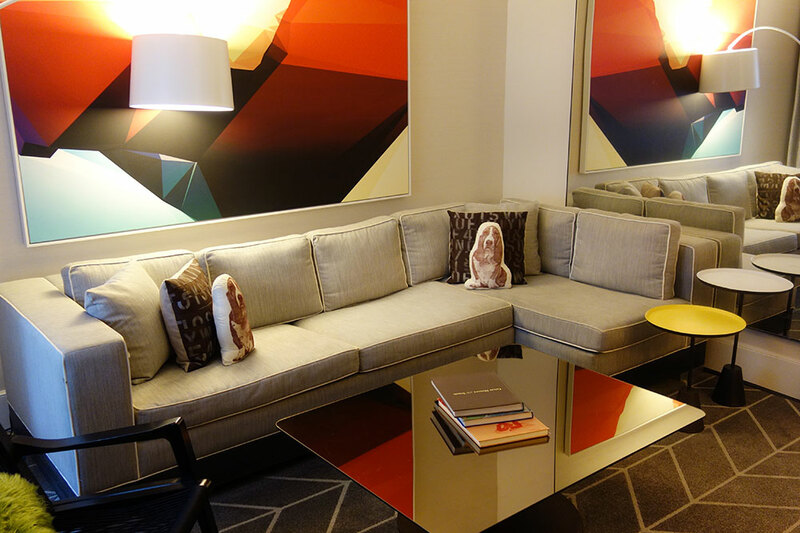 (These include packing and unpacking, light pressing, shoe shines and a concierge service.) The best rooms at The Spectator have views of the St. Philip’s Church steeple and the Charleston City Market; some also have private patios. Our room — “suite” seemed a bit of a misnomer, since the only seating was a pair of chairs at a table by the window and a single armchair with an ottoman — was filled with light and elegantly furnished. 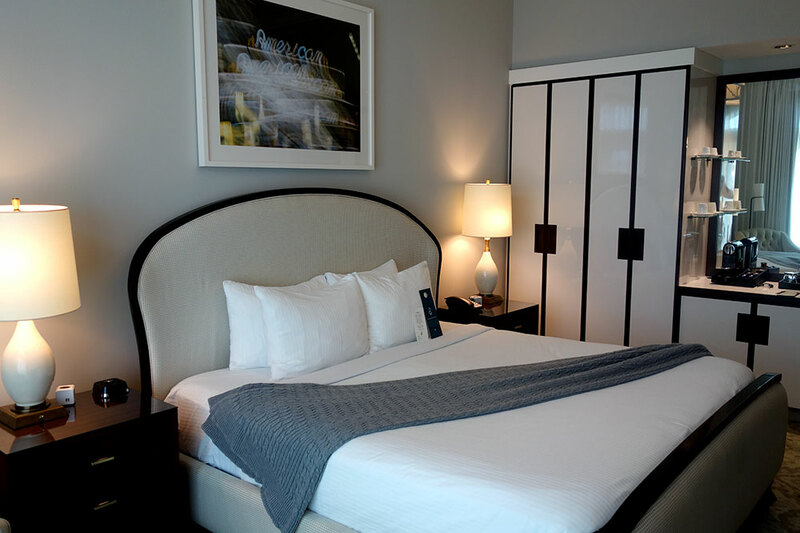 The large bed came with an oyster-gray headboard and was made up with the highest-quality cotton sheets. Thick wall-to-wall pearl-gray carpeting muffled all sound, and the lighting was gentle, with a circular light-diffusion board overhead and a number of table lamps. Framed drawings, photos and prints added character. The white Carrara marble bath came with stacks of fluffy towels and oversize chenille bathrobes, plus locally made organic Deep Steep bath products. The hotel’s management understands that memorable hotels tend to be made in the details, which should be both generous and original. 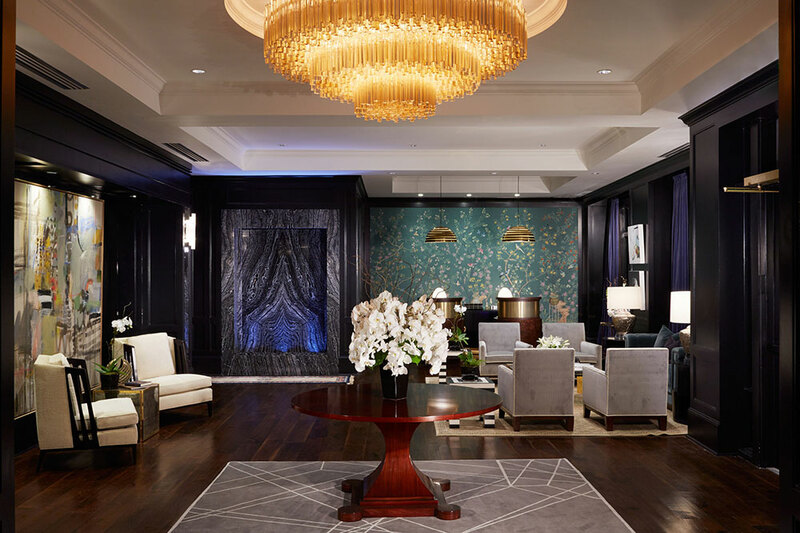 At The Spectator this means hand-painted wallpaper in the hallways and, in the minibar, locally made candies and snacks, including benne wafers, a Lowcountry treat. The property lacks a restaurant, but an excellent “locavore” breakfast is served in your room as part of the nightly rate. 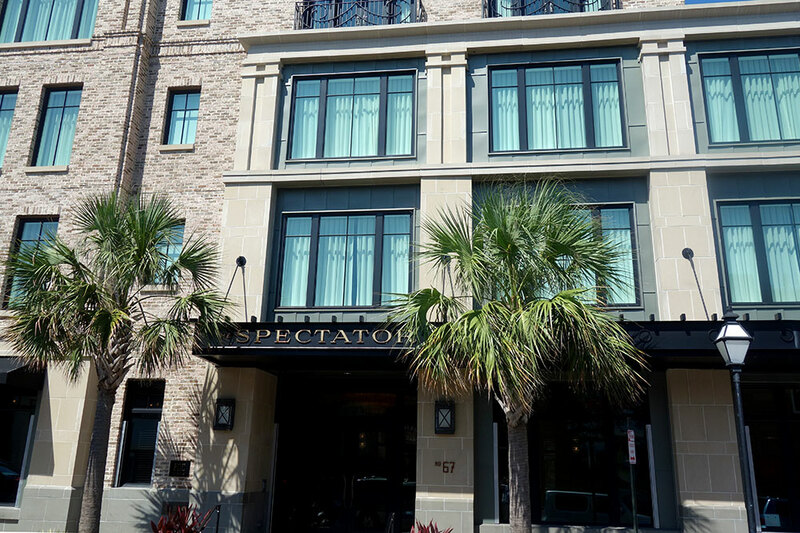 Overall, The Spectator is a lovely hotel — even though the friendly service could use a little fine-tuning — and an excellent choice for those who prefer an address with a distinctive contemporary style, rather than the carefully staged antebellum charm that provides a benchmark for the Charleston hotel scene. Great central location; the outstanding bar; the excellent room-service breakfast. 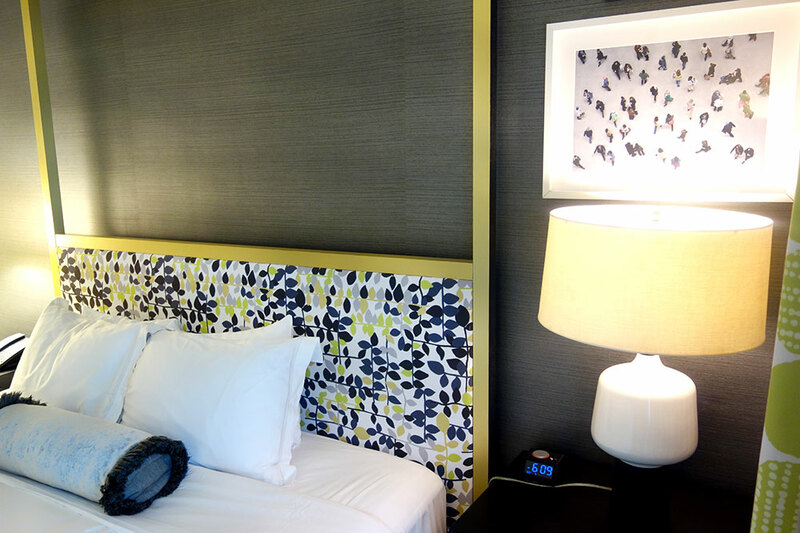 The 4 p.m. check-in, which offers guests a miserly amount of room time for the daily rate that is charged. Just a few blocks from the hotel, Waterfront Park is a great place for a morning jog or walk; rooms overlooking State Street can be noisy. 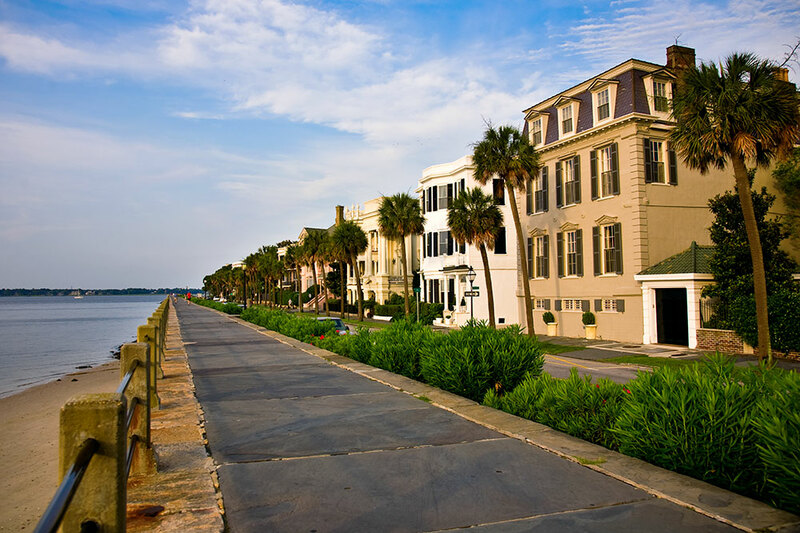 The following morning, we rose early, since Charleston is especially charming before the crowds thicken, and took a long and very pleasant walk around The Battery with its scenic promenade, historic park and fortified seawall at the southernmost tip of the Charleston peninsula. 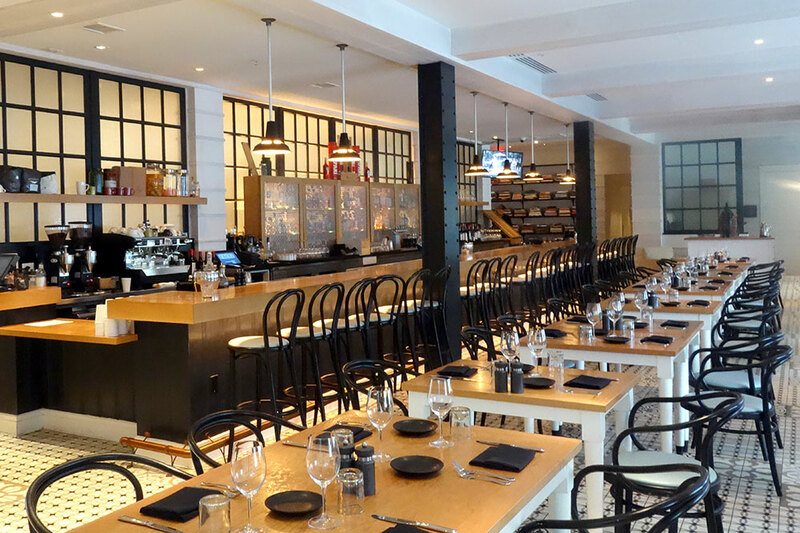 Later, we enjoyed a light lunch of grilled cheddar, pear and squash chutney sandwiches and black-bean nachos at Basic Kitchen, an excellent, casual restaurant near The Dewberry hotel on Wentworth Street. Afterward, we visited the recently renovated Gibbes Museum of Art, which has a fine collection of Charleston Renaissance paintings (a period between World Wars I and II), and then shopped for sweet grass baskets, a bona fide American craft product of real charm and utility at the Charleston City Market. An excellent dinner at the newly opened Establishment, an easy 10-minute walk from The Spectator, concluded an almost perfect day. Heading south to Savannah, we followed Highway 17 through the Lowcountry, a relaxing drive between marshes punctuated by white egrets and live oaks draped with floating jade-green tassels of Spanish moss. 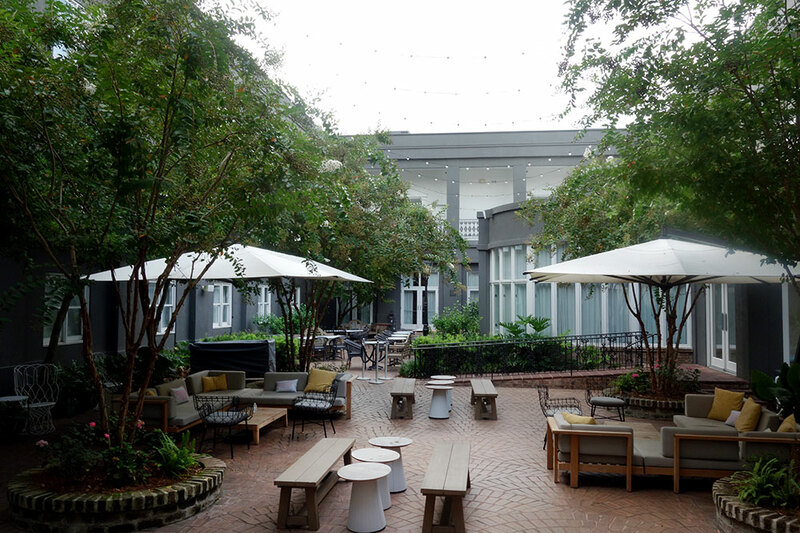 The Kimpton Brice Hotel occupies an 1860s three-story brick-and-cement building at the northeastern edge of the historic district on the Savannah River. In previous incarnations, it has been a Coca-Cola bottling plant, stables and a cotton warehouse. Jaunty yellow awnings accent the windows on the main façade. 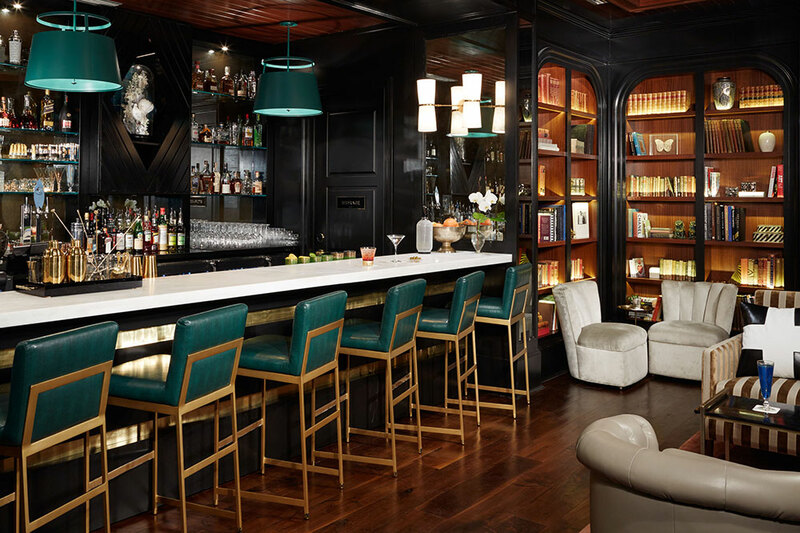 Part of the San Francisco-based Kimpton chain of hotels, it has the same youthful and playful style of its other properties. A bellhop in a white polo shirt and Bermuda shorts greeted us on arrival and took away our car. In the surprisingly small lobby, a crowd was enjoying the daily complimentary wine hour, and the receptionist seemed distracted as she hurriedly checked us in. Located on the first floor off a breezeway, adjacent to the hotel’s pretty courtyard garden, our King Suite came with a living room furnished with a sectional sofa, a black glass coffee table piled with art books, a gray quarry tile floor and a large abstract contemporary painting of yellow, red, mustard and blue planes. The room was lit by both floor lamps and overhead fixtures, since the only window was adjacent to the front door and overlooked the breezeway. 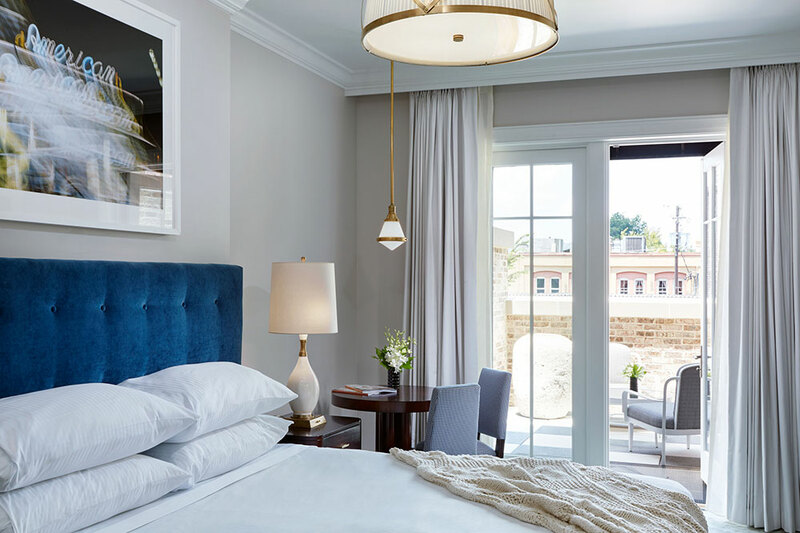 The bedroom at the back of the suite overlooked East Bay Street, a busy thoroughfare, but was attractively furnished with a a four-poster bed with a tufted leaf-print headboard and white cotton sheets and a brass-trimmed glass-topped writing desk. A spacious bath came with a wet room holding a powerful shower, Atelier Bloem bath products and seersucker bathrobes. The Brice offers guests an array of amenities, including a small fitness center, an outdoor pool and complimentary bicycles. The hotel’s Pacci Italian Kitchen + Bar serves a contemporary Italian menu, and there is a large and attractive bar, which mysteriously never seemed to be open when we returned to the hotel eager for a nightcap. Aside from its good location, perhaps the best thing about this property is that it expresses the youthful and cutting-edge personality of the new Savannah, a place brimming with students at the Savannah School of Art and Design, as well as a host of young creatives who’ve been attracted to the city by its beautiful architecture, laid-back atmosphere and penchant for having a thoroughly good time. The excellent location on the Savannah River; the stylish modern interior design. Rooms on the East Bay Street side of the hotel suffer from traffic noise and are to be avoided. Make this clear at the front desk when you’re checking in. Breakfast prices are too high, and the hotel should keep the bar open at least until midnight. There are many public garages within a short walk of this hotel, so it’s up to you whether or not you want to spend the $31 a night that the hotel charges to park your car.